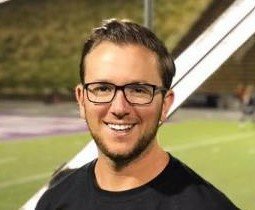 This will be Kyle Marx’s first year on staff with the Phantom Regiment Drum and Bugle Corps. Kyle Marx is the Assistant Band Director at Weiss High School in Pflugerville, Texas. Prior to joining the Weiss band program, Kyle Marx was the Associate Director of Bands at Westfield High School in Spring, Texas where he helped the band program receive numerous UIL Sweepstakes Awards. While at Westfield, Kyle Marx was instrumental in the growth of the program from 90 members in 2015 to 175 members in 2017. Kyle Marx spent several years on the Visual Staff for the Blue Knights Drum & Bugle Corps based in Denver, CO. Prior to that, Kyle began his drum corps teaching career on the Visual Staff at The Troopers Drum and Bugle Corps. In the indoor community, Kyle has been involved with Monarch Independent and Rhythmic Force Percussion programs. Kyle Marx was a member of the Madison Scouts Drum and Bugle Corps from 2011 until 2013 as a Lead Trumpet player. As an alumnus of the corps, he joined the Scouts in New York City for the 2014 Macy’s Thanksgiving Day Parade. Originally from Southeast Ohio, Kyle received his Bachelor of Music degree in Music Education from Ohio University in 2015. While at Ohio University, Kyle served as a Music Section Leader for the YouTube sensation “Marching 110,” a consistent member of the Wind Symphony, and Co-Principal Trumpet of the Symphony Orchestra.